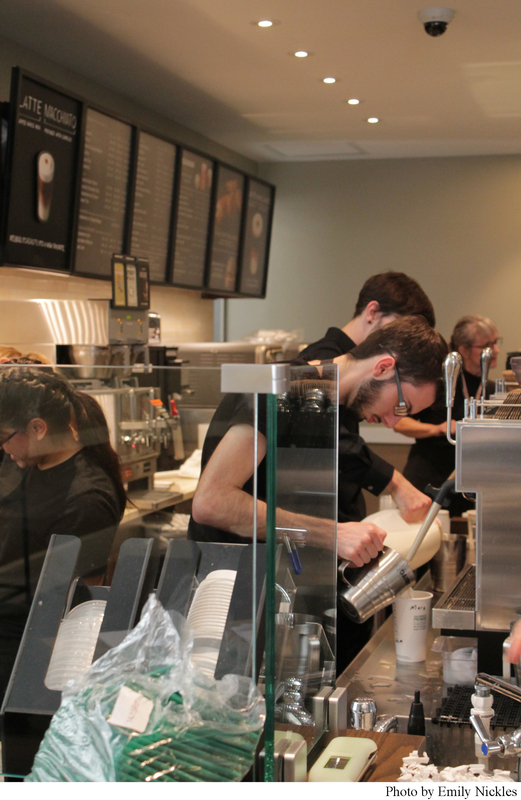 No longer do students have to leave campus or walk down University Dr. to get Starbucks coffee after hours. 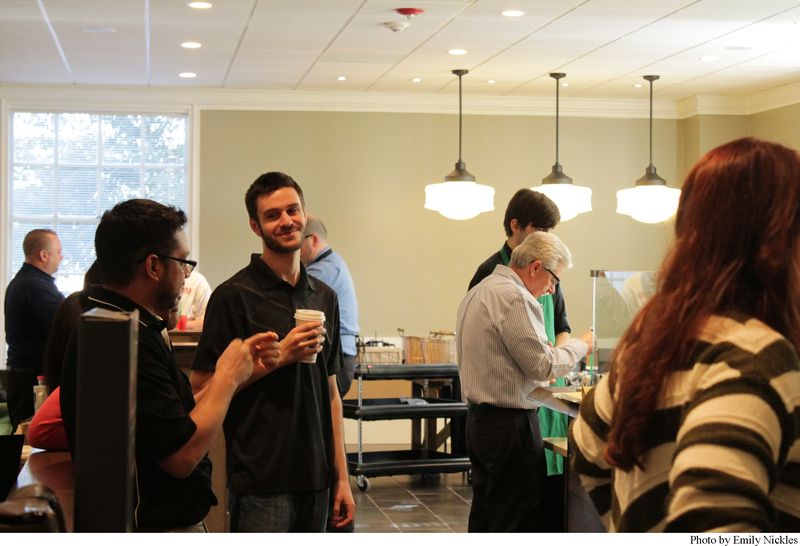 TWU has officially opened its first fully functioning Starbucks facility in the Blagg-Huey Library on campus. 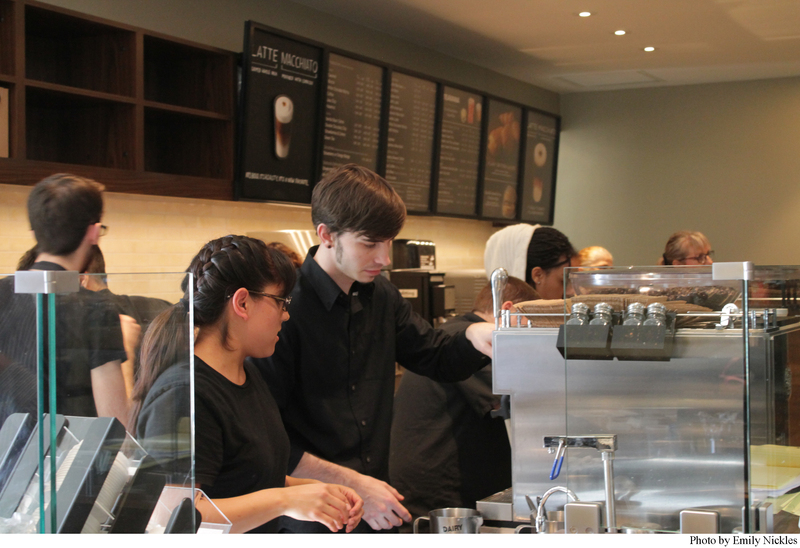 Tuesday, Jan. 19 beginning at 7:00 a.m. was the first time Starbucks has operated under normal business hours, and for many students it was their first time viewing the space. The Starbucks is located where the former computer lab used to be—between the exterior and interior vestibule doors of the library. The computer lab was relocated to the second floor of the library before the winter break and is accessible for collaborative or individual studies near the Pioneer Center for Excellence. Director of ID Systems & Contract Auxiliary Services Beth Lewis headed this project with Director of Food Services John McRae. Both worked closely with a team of designers, construction specialists and representatives from Starbucks to renovate the space. 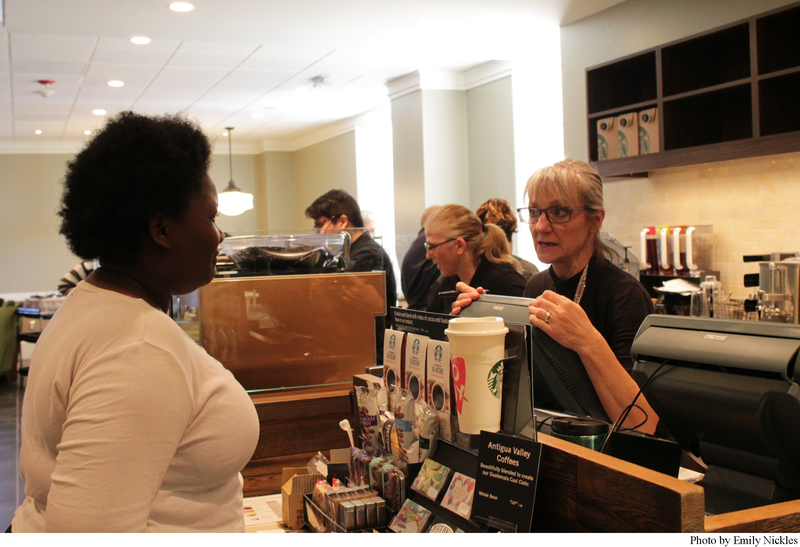 Lewis shared in an interview what she felt was the goal of her team when TWU created a contract with the Starbucks franchise and began reworking the space: “The goal is to have facilities on campus that incorporate the sense that this is a students’ campus. To Lewis it seemed like the decision to choose Starbucks for our new food service and facility on campus was a no brainer, “What better combination than books and coffee, books and coffee and conversation? It’s just a natural fit.” The hope is also that the facility will be useful and convenient for faculty and staff who stay later on campus to prepare lectures, presentations, or review papers. To eliminate confusion about which entrance students should use to enter the Starbucks, Lewis clarified that though two doors were previously installed for use of the computer lab, the Starbucks will only use the first door inside the vestibule. This is to prevent students from interfering with the library security system—an alarm that reminds students to check-out library materials before exiting the building. The second door on the interior of the library will be used as an emergency exit and a utility door for employees. If there is any fear of a noise level becoming disruptive in the library it’s only that of students or community members entering the library at the front. Noise buffers were incorporated in the construction to prevent sounds of conversation and machinery to carry through, according to Lewis. Stepping outside of her role, Lewis stated: “My favorite part of the Starbucks is what it contributes to the campus. I really like their sustainability and that they are environmentally aware. As a customer, I love the idea of, as I mentioned…I can just make a short stroll across this beautiful campus and maybe sit in the library for a little bit…” For faculty and staff, it seems like an optimistic option to take a break while not having to leave the campus for coffee or snacks. In the future operations of the Starbucks, Lewis shared that they are working to set-up their Point of Sale system to accept Starbucks gift cards and awards. In the meantime, students can use their campus dining dollars to purchase drinks and snacks. Outdoor seating for the spring is also another option that they are considering. The ground slopes and poses a problem for table settings at the moment. Keep checking with the Starbucks staff for a future coffee ground program, where students can request used coffee grounds to be used for composting. As the new Student Union design is underway, Lewis and McRae will consider future contracts for new facilities on campus when the construction is completed or re-envisioned use of dining spaces. The Baker’s Dozen will no longer be operating out of the current Student Union—it has closed down and the space will be repurposed and revitalized in the meantime. Bakery Items: Pastries, assorted breakfast breads, cookies, cakes, etc.